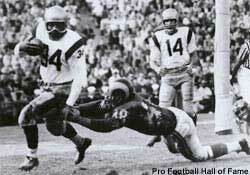 Fullback Joe Perry of the 49ers became the first player in league history to gain 1,000 yards rushing in consecutive seasons (1953-54). The NFL policy of blacking out home games was upheld by Judge Allan K. Grim of the U.S. District Court in Philadelphia, November 12. The Lions again defeated the Browns in the NFL Championship Game, winning 17-16, December 27. The bonus selection in the draft was eliminated, January 29. The last selection was quarterback King Hill of Rice by the Chicago Cardinals. Halas reinstated himself as coach of the Bears. The AFL adopted the two-point option on points after touchdown, January 28. A no-tampering verbal pact, relative to players' contracts, was agreed to between the NFL and AFL, February 9. The NFL owners voted to allow the transfer of the Chicago Cardinals to St. Louis, March 13. The AFL signed a five-year television contract with ABC, June 9. The Boston Patriots defeated the Buffalo Bills 28-7 before 16,000 at Buffalo in the first AFL preseason game, July 30. The Denver Broncos defeated the Patriots 13-10 before 21,597 at Boston in the first AFL regular-season game, September 9.